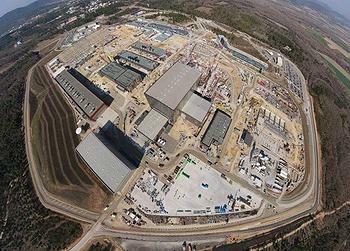 SAINT PAUL-LEZ-DURANCE, France, July 3, 2018 (ENS) – There may be lingering disagreements among China, the European Union, India, Japan, South Korea, Russia and the United States, but there is one complex project these seven entities have in common that is on track for success – the world’s largest nuclear fusion facility. This first global collaboration on building a nuclear fusion reactor is taking place at Cadarache in the south of France. Construction of the reactor began in 2017 and is now more than 50 percent complete. It is scheduled to achieve first plasma in December 2025. This means that the reactor will be able to generate a molten mass of electrically-charged gas, known as plasma, inside its core. Deuterium-tritium fusion experiments are scheduled to begin in 2035. The seven participants in the International Thermonuclear Experimental Reactor, ITER, are building the 500 megawatt tokamak fusion device designed to prove the feasibility of fusion as a large-scale and carbon-free source of energy that is safe, abundant and environmentally responsible. Fusion is the process that powers the Sun and the stars; when light atomic nuclei fuse together to form heavier ones, a large amount of energy is released. At its 22nd meeting on June 20 and 21, the ITER Council reviewed in detail the latest reports and indicators covering organizational and technical performance. ITER Council Members jointly reaffirmed the importance of the mission and vision of the project. The ITER Council evaluated the most recent reports of manufacturing, construction and installation progress for the fusion reactor, including the latest measures of performance. The Council approved refinements to the construction strategy proposed by the ITER Organization to optimize equipment installation in the Tokamak Complex Building. With this strategy in place, the project remains on track for first plasma in 2025. The Council agreed that substantial progress has been made on the fabrication of technologically challenging components such as vacuum vessel sectors and toroidal field magnets, as well as on installation of the cryoplant, site service building and magnet power supply and conversion. Based on the latest performance metrics, project execution to achieve first plasma is over 55 percent complete. Since January 2016, ITER has achieved 33 scheduled project milestones, including the recent commissioning of the first experiment of the SPIDER Neutral Beam Test Facility in Padua, Italy. The specialized components – some 10 million parts in total – are being manufactured in industrial facilities all over the world. Then they are sent to the Cadarache worksite to be assembled into the final machine. Europe is contributing almost half of the costs of construction, while the other six members: China, India, Japan, South Korea, Russia and the United States, are contributing equally to the rest. Construction costs are expected to be around €20 billion (US$22 billion), with components contributed by the ITER members on an “in-kind” basis. 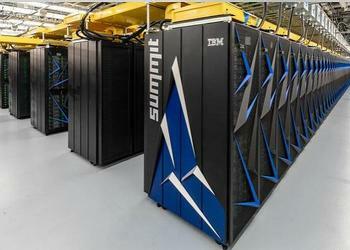 Summit, the world’s fastest supercomputer, recently launched at the Oak Ridge National Laboratory in the United States, will be instrumental in accelerating fusion research. The new supercomputer takes computing powers to new heights. Summit can perform 200,000 trillion calculations per second – or 200 petaflops – that is 200 quadrillion calculations, eight times more than the previous record-holder at the Oak Ridge National Lab, Titan. The massive machine, weighing more than a commercial aircraft, is also the world’s largest computer equipped with artificial intelligence – a machine whose software will write new software. Harnessing Summit’s capabilities in machine learning and simulation as well as in artificial intelligence and deep learning will allow researchers to accelerate scientific discovery in nuclear fusion.